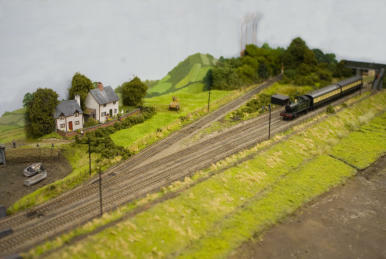 Layout Manager: Chris Round, Deputy Dave Jeanes This ‘00’ gauge layout represents a small fictitious Great Western terminus in the period 1934/35. As well as the connection to the main line between Barry and Bridgend there is also a branch line to the nearby Power Station (not actually built until 1960!). The layout is operational, the ballasting has been completed and a number of ‘cassettes’ for the fiddle yard have been built. 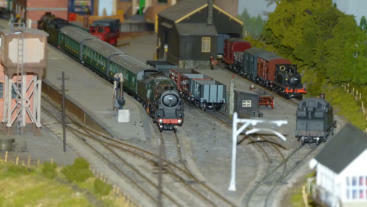 A number of kit built locomotives were donated to the Club a few years ago and these will form the backbone of the motive power on the layout. Presently the back scene is being strengthened to aid transportation before constructing a lighting unit. 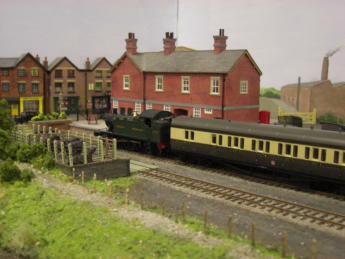 The terminus building with a small prairie and B set arriving with a train from Barry. The approach to the station with the power station branch line disappearing between the trees. The power station chimneys can be seen in the background.